Laptops are very convenient but pose many ergonomic problems if used intensively. Their screens tend to be smaller, lower and darker than desktop monitor screens. 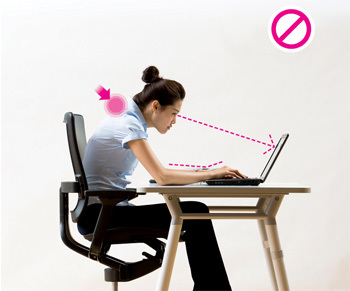 Working long hours with your laptop placed on the desktop can cause pain from excessive neck and shoulder flexion. The laptop screen and keyboard cannot be separated, which encourages users to lean forward to key; this can lead to poor posture. Consider elevating your laptop so the top tool bar is at your eye level. You can do this by placing it in a laptop riser. 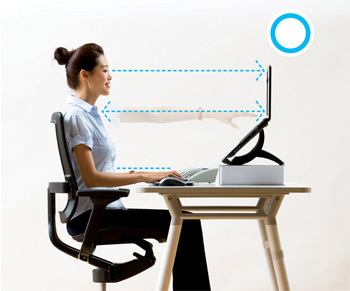 Many risers have a built-in document holder which can elevate your source documents directly in front of you; this can reduce neck pain from looking down at documents placed flat on the desktop. Another solution is to use a docking station at work. Never use your laptop keyboard in an elevated position – this can cause wrist pain. Instead, use a separate keyboard and mouse.